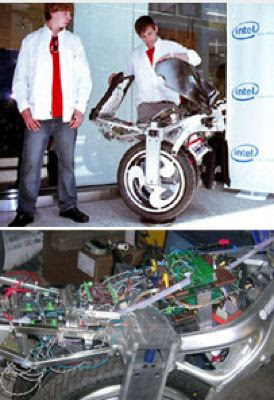 Ben Gulak and Jason Morrow from Ontario Canada (who represented Team Teen Canada in Albuquerque, New Mexico at the annual Intel International Science and Engineering Fair Intel ISEF May 2007) invented this electric vehicle that rides as a motorcycle and produces zero emissions. Accelerometers, control the wheels have an actuating system which gives the relative position of the bike relative to the ground so the driver leans forward and gives it angle and the speed at which your leaning forward. As the rider leans over the gas tank like on a sports bike the Tango distributes the majority of the weight along the wheels.. The Tango can reach top speeds of 40 miles per hour and Morrow claims it is more practical than the Segway or the embryo from Bombardier. The whole package is powered by amped-up wheelchair motors and 36-volt batteries.